I described my day job as traffic signals engineer and my volunteer night position as flyer producer for worthy causes like #walknbike day October 9th! 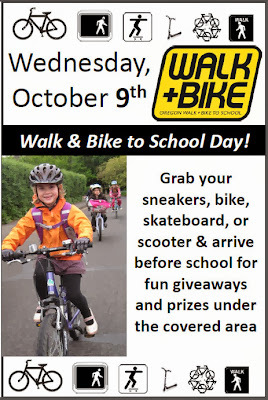 Get excited and join me in getting the kids in the neighborhood to school in a multimodal fashion. I don't make flyers very often, but it was fun to think about how to share a message about something that used to be a very normal thing to do, but now has to be something that we take a day to make a big deal about and distinguish as a particular day that we walk & bike.